Last week on The Writer’s Alleys blog that I’m a part of, we had a guest post by the amazing Allen Arnold. I think we all struggle with how to juggle the things we have going, and feeling like we fail with too many pots boiling and not enough hands to stir. I know I do anyway!!! His post was a spectacular reminder that our time is GOD’S, and just like our money, if we entrust ALL of it to God and pray He gives us wisdom with how to use it, then we won’t run dry. God provides, both our daily material needs as well as our schedule needs. Go read his post, though. He says it much better that I every would!! Something else struck from his post though, even more so than about my time management. Now I’m good to get a handful, and many times none at all. At its height, my page visits were in the thousands per day. Now there are days I struggle to stay in the hundreds. Some of that is because of Annabelle. Everyone followed her story and wanted to check up on her, and there isn’t the urgency/need now that she is doing SO much better. I expected… and even wanted… those numbers to go down, because it meant that my sweet girl was doing well. There were some days my heart wasn’t in it, so I just wrote something to get it down in an attempt to keep something out there for people to read. There were other days that I was super passionate about at topic and spent an hour or more typing it just right. In both cases, there were many (ahem— most–) days when it just fell flat. No reaction. Barely a Facebook like. Comment section was like birds chirping. The writer in me panicked. What am I doing wrong? Is my writing crappy? Am I not hitting the topics that readers are interested in? I’ve experimented with various kinds of post, and except for the ROCKIN’ blog party the other week when both comments/visits were through the roof…. it all just felt stagnant. Void of my normal passion and void of God’s blessing. But reading Allen’s post, something very deep hit me, and it was the heart of why blogging had been so unsettling to me lately. giving me a foretaste of what the people I’m writing to are feeling. YES! THAT is what I want. I’m so very tired of trying to analyze what readers want to read, what their sweet spot is. I want to know what GOD’S sweet spot is… what HE wants to go after in my writing. YES, the reason I blog is to share my heart with readers, but instead of turning to GOD for the divine wisdom of what my readers need, I’ve been using my own brain to try to figure it out. And failing MISERABLY. I’ve forgotten my own deep held belief that a NUMBER, in the end, isn’t what matters. It’s the HEART that matters. If whatever I’m doing, whether writing books or blogs or Facebook posts, is for JESUS, then the rest will come as God wills. If there is just ONE person God wants to read something, and that is ALL the impact my writing has, then it’s enough. I’m telling you right now, I won’t be perfect. A some of my posts will probably be stupid and fall flat. But I’m going to start treating my blog like my books. Prayerfully asking God to give me wisdom as to what to write. To breath life into my fingers as I type. Reminding myself that my worth… my BLOGS worth… is more than numbers or comments or links. The goal isn’t book sales and page views and comments. The goal is to, as a community of believers, share each others burdens. To truly figure out how to find the JOY and PEACE that God wants to give as we go on this journey. It is to go after the HEART of God, to please HIM and give him glory with every letter typed. Oh how I can pray that I do this with both my books AND my blog. And if I can’t… well, then I just need to stop doing it all together. 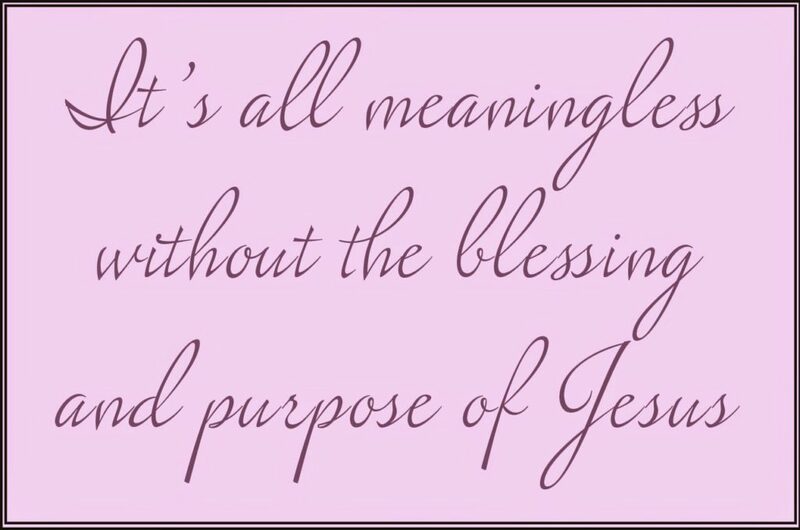 Because it’s all meaningless without the blessing and purpose of Jesus. Discussion: Do you have things in your life you need to toss over to God’s hands? Things you are using the WRONG measuring stick to assess? Areas where you are working hard in your own wisdom but forgetting to tap God’s heart to see where He wants to lead? I enjoy reading your blog. I do wonder how Annabelle is doing, however. How is her eating and communication coming along? Didn't she start school recently? And thank you, I'm glad you enjoy reading my blog! !